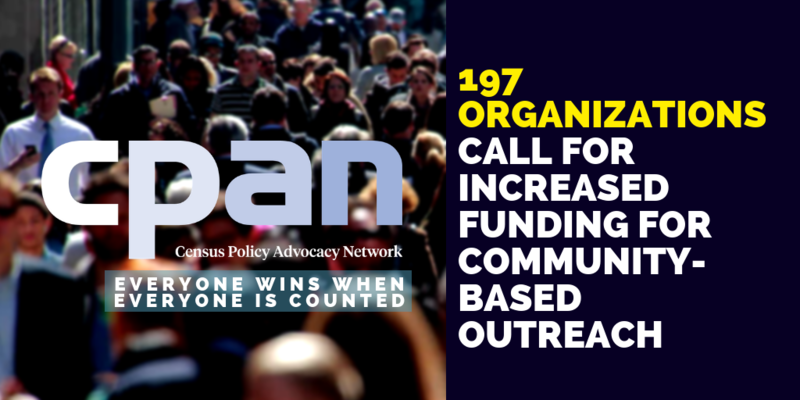 The SELA Collaborative proudly joined 197 organizations and the Census Policy Advocacy Network (CPAN) in calling for increased funding to support community-based outreach for the 2020 Census. An estimated 16.2 million Californians qualify as hard-to-count (HTC), and it is estimated that every uncounted person costs California about $2,000. The Southeast Los Angeles region, where approximately 92% of all census block groups are considered hard-to-count according to the U.S. Census Bureau, would be particularly negatively impacted by an undercount, and would lose out on key federal funds needed to pay for vital services and programs on issues ranging from education to health to transportation. We cannot afford an undercount in our region, and motivating the millions of HTC residents to participate in the 2020 Census will require robust and coordinated outreach by trusted messengers who can validate government messages and alleviate anxiety about completing the census questionnaire. For these reasons, we joined the 197 organizations calling for an additional $93.4 million in the 2019-20 budget. We believe the additional funds will help reach 16.2 million individuals living within and outside of HTC census tracts. The importance of the 2020 Census to the Southeast Los Angeles region cannot be overstated! We are proud to be working collaboratively with stakeholders across the SELA region to help spread the word about this critical issue. #SELAcounts! You can read the full letter via the following link: http://bit.ly/2FNmMWJ. Join our mailing list to receive the latest news and updates from the SELA Collaborative.